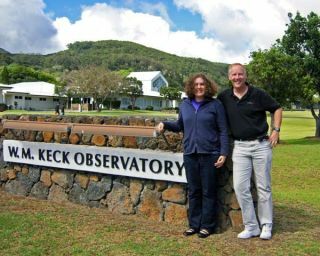 Dr. Mark Showalter and Bekki Dawson at Keck Observatory. In lateafternoon, the wispy clouds part. For the first time I discern the distantdomes, tiny and white, on the peak of blue-grey Mauna Kea, but a heavy cloudhovers above. Dr. Hammel tells me that once the sun sets, this cloud will cool,sink and wrap the telescopes in its fog, unless – there's a small possibility –the cloud sinks all the way beneath the summit, down below the telescopes.Despite the bleak predictions in all the weather forecasts for tonight, I beginto hope that we'll finally get some data. I am atKeck Observatory in Hawaii for the Uranian astronomer's equivalent of Halley'sComet: ring plane crossing. It is the last night of the observing run for theteam greeted by the Keck Observatory staff as "the ring plane crossingdudes": Dr. Imke de Pater of UC Berkeley, Dr. Heidi Hammel of the SpaceScience Institute, Dr. Mark Showalter of the SETI Institute, and me, Dr. Showalter'ssummer research student, an eager undergraduate who has just finished hersophomore year at Wellesley College. Earlier this week, as my plane took offfrom Boston, I watched the plane's shadow on the harbor shrink as we ascended.The airplane turned and as the wing on my side tilted toward the water, theplane's shadow collapsed into a line. This is just what I hope to see in Hawaii, the once-in-forty-two-years geometry of the Uranian ring plane crossing period: asEarth crosses the plane of the Uranian rings, we view the rings edge-on. Ring planecrossing is a unique time for astronomers to study both the Uranian ringstructure and to detect faint moons usually obscured by the glare of therings. The three nights we're observing, September 6th-8th, are alsoOpposition, when the Earth lies on a straight line between the Sun and Uranus,a particularly good geometry for viewing faint moons. Small, faint, innerUranian moons are the subject of my research tonight, as I've spent the summerstudying their chaotic motions. Their trajectories, though not random, are sosensitive to initial conditions as to be unpredictable. But the opportunity tostudy the chaotic Uranian satellite system with the 10-meter Keck II telescopehad been jeopardized by the paradigm system of chaos theory, Earth weather. Dr.Showalter had originally invited me to observe with him in August, but thattrip was canceled at the last minute due to an approaching hurricane. Now,during this observing run, we have obtained hardly any data because of fog andhumidity. Everyone has begun teasing Dr. Showalter because there's always badweather when he's on the island. But, we have one more night to attempt anobservation of Uranus during ring plane crossing at Opposition. As Ianticipate observing Uranus for the first time, I remembered the time Iinitially observed a planet with moons and rings. At the Whitin Observatory at Wellesley College, on a crisp, clear New England November night, I located the lever in therare red light and pushed it to rotate the creaking dome until Saturn was in theslit. Using the system of ropes attached to its brass body, I positioned thefifteen foot long, fifteen-thousand pound, one-hundred-and-fifty year oldrefracting telescope, scrambled up a wheeled-staircase, and pressed my eye tothe ice-cold eye piece. As I turned the knob to focus the lens, Saturn sharpenedinto view, its tiny moons and rings perfect, exquisite and almostunbelievable. Two yearslater, I am observing the moons and rings of Uranus in an air conditionedcomputer lab under the glare of white fluorescent lights. Dr. Hammel is talkingto the telescope operator at the summit through a video link, Dr. de Pater istyping commands into the computer that controls an infrared CCD camera attachedto the telescope, and Dr. Showalter is optimistically monitoring the output ofa humidity measurement instrument at the summit. As we were preparing thatafternoon, a staff member wheeled in a new, modern set of ergonomic leatherchairs intended to make the long hours spent observing more comfortable. Butthe most amazing modern marvel at Keck Observatory is the adaptive opticssystem. I wasshocked when Dr. Showalter told me, "Keck beats out Hubble on a lot ofthings now." How can observations from Earth even with 10 metertelescope in the thin, dry atmosphere at 14,000 feet possibly be better thanobservations with the Hubble Space Telescope? When light enters the atmosphere,it is scattered by our turbulent, chaotic atmosphere, and we see a blurred anddistorted image; this is why the Hubble Space Telescope, which orbits above theatmosphere, takes such sharp and detailed images. But, for about five yearsnow, light entering the Keck telescopes has been corrected for atmosphericdistortion by an adaptiveoptics system. We cannot predict how chaotic atmospheric turbulence willdistort the light, but, with the adaptive optics system, we can measure andcorrect for the distortion a thousand times a second. Unfortunately, adaptiveoptics cannot fix bad weather. As we run our preliminary tests the humidity ischanging rapidly, and, when the interesting feature on a test image is blurredout on the real exposure, Dr. Hammel suggests with a sigh, "We could drawit, as astronomers did 200 years ago." Around midnighton our last night, as the humidity drops and the air stabilizes, we finallybegin to get some excellent data. Soon the "seeing" (a measure of theimage's blurriness) is down to 0.39 arc seconds, the best possible seeing onEarth. "You can never trust the weather predictions," says Dr. dePater, and I smile to myself because unpredictable weather has given me achance to observe Uranus' unpredictable moons. Thirty years ago Uranus' ringswere discovered during observations from an airplane by detecting a dip instarlight when a star passed behind them; tonight we resolve the different ring bandsedge-on from Earth. This night we also observed volcanoes on Jupiter's moon Io;and the moon of asteroid (45) Eugenia, which was discovered in 1999 using theadaptive optics system. The weatherhas been perfect, so Dr. Showalter is formally absolved of causing HurricaneFlossie in August. Then the night is over, and as the sun rises I stand outsidethe observing station looking to the south and see the peak of Mauna Kea is once again obscured by clouds. Suddenly I make the connection between all thechaotic systems that I've struggled to understand tonight – the weather, theatmospheric turbulence, the Uranian moon motions – and realize that thisexperience wasn't once-in-forty-two-years but once-in-an-eon. Valentine in TomStoppard's Arcadia marvels that, "A door like this has cracked open fiveor six times since we got up on our hind legs." Only recently have wedeveloped the numerical methods and fast computers necessary to understandchaotic systems, systems where, as Valentine says, "the unpredictable andthe predetermined unfold together." Not only weather, moons, andatmospheric turbulence but most systems in the real world are chaotic:population growth, water dripping from a faucet, the stock market, traffic, thehuman heart. As the Earth's orbit passes through the Uranian ring plane, we onEarth are entering a new mathematical and scientific era. My travelexpenses were generously covered by Wellesley College Astronomy Department'sWilson-Birney Fund, Massachusetts Space Grant and the National ScienceFoundation, which also funded my summer research at SETI.